Robert Bonhomme tattooing a chameleon on my ribcage. The summer after my 18th birthday was when I finally decided to get inked. 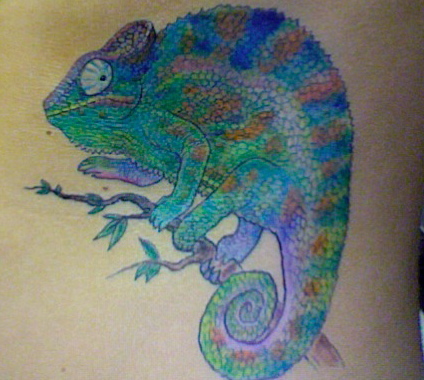 After I made my appointment at Brooklyn Tattoo, I walked out thinking, wow, in just a couple of days I’m going to have a chameleon on my ribcage. Aside from the thought that my skin would be permanently altered, I kept wondering if I’d be able to handle the pain. When the day finally came, I was extremely anxious. I laid down on the table and Robert, the tattoo artist, just told me to relax. I heard the piercing sound of the tattoo machine and I was terrified. When the needle hit my skin I didn’t think it was so bad, but after a few minutes into it I was biting holes into the collar of my shirt in order to ease the pain. About four hours into it I went completely numb from the needle just gnawing away at my skin (at least that’s what it felt like). The worst part for me was the coloring of the tattoo, because the tattoo artist actually just colors in your skin with a needle that is puncturing it 50 to 3,000 times per minute. It was not a pleasant experience at all. The finished product (I named him Riley). first tattoo. He was shocked to find out that I was getting a pretty sizable tattoo on my ribcage for my first tattoo. “That’s pretty badass,” he said. Three tattoo sessions and about $300.00 later, my tattoo was finally completed and I couldn’t have been any more happy with it. The excruciating pain and the cost was well worth it.